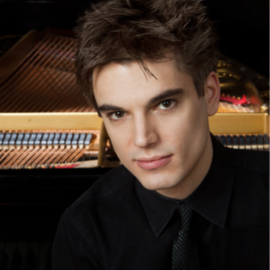 Born in Durham, North Carolina, pianist ANDREW TYSON is emerging as a distinctive and intriguing musical voice. First Prize Winner of the 2011 Young Concert Artists International Auditions, he will make his New York debut at Merkin Hall and his Washington, D.C. debut in the Rhoda Walker Teagle Concert at the Kennedy Centers Terrace Theater this season in the Young Concert Artists Series. Recital appearances this season include at the Krannert Center for the Performing Arts, University of Illinois at Urbana-Champaign, the Lied Center of Kansas, the Brownville Concert Series, and the Falany Center for the Performing Arts, and a tour of New Zealand. Andrew Tyson has performed at prestigious venues including Caramoors Rising Stars, The Coolidge Auditorium at the Library of Congress in Washington, DC, the National Chopin Foundation in Miami, the Paul Klee Zentrum in Bern, the Filharmonia Narodowa in Warsaw, and at festivals including the Brevard Music Festival, the Festival de Sintra in Portugal, and the Festival Cultural de Mayo in Guadalajara, Mexico. In June 2010 he participated in a two week tour of Europe as a part of Curtis on Tour performing with violinist Pamela Frank. In May Mr. Tyson won The Juilliard School's Gina Bachauer International Piano Competition. He has performed as soloist with the Durham Symphony, the Raleigh Symphony, the Chapel Hill Philharmonia, the Old York Road Symphony, the Frost Symphony Orchestra of the University of Miami, and the Chamber Orchestra of the Triangle. Born in 1986, Mr. Tyson made his orchestral debut at the age of 15 at the Eastern Music Festival with the Guilford Symphony Orchestra as winner of the festival's concerto competition. He studied with Dr. Thomas Otten of the University of North Carolina. He earned his Bachelors degree from the Curtis Institute of Music working with Claude Frank, his Masters degree at The Juilliard School working with Robert McDonald, and is currently in the Artist Diploma program at The Juilliard School. In May Mr. Tyson won The Juilliard School's Gina Bachauer International Piano Competition. He has performed as soloist with the Durham Symphony, the Raleigh Symphony, the Chapel Hill Philharmonia, the Old York Road Symphony, the Frost Symphony Orchestra of the University of Miami, and the Chamber Orchestra of the Triangle. Born in 1986, Mr. Tyson made his orchestral debut at the age of 15 at the Eastern Music Festival with the Guilford Symphony Orchestra as winner of the festival's concerto competition. He studied with Dr. Thomas Otten of the University of North Carolina. He earned his Bachelors degree from the Curtis Institute of Music working with Claude Frank, his Masters degree at The Juilliard School working with Robert McDonald, and is currently in the Artist Diploma program at The Juilliard School.